With Christmas fast approaching and festivities in full swing, this Christmas would you be interested in allocating one day or a period of days in your establishment to help support UK homeless feeding during the season of goodwill? Every year, there are thousands of unfortunate people forced to live on the streets of London, braving the harsh winter on empty stomachs as they have no alternative. Help us make their winter just a little bit warmer and comfortable by donating a small percentage of proceeds from every drink, dish, product or meal transaction made at your establishment. At TAPF our programme ‘Mission Zero Hunger’ feeds freshly cooked, hot and nourishing meals to 2000 rough sleepers across four feeding stations every day in London. How does ‘Gift A Meal’ work? Whether you partner with us for a day or whole month, choose one menu item or all your sales, please know that every penny you donate will be used to feed a hot meal to a person struggling on the cold streets of our city this winter. 25p = 1 plate of hot and nutritious food. In return, we will promote your business via social media to encourage maximum footfall across the day(s) you agree to undertake the ‘Gift A Meal’ initiative. We will also publish relevant coverage on our website under our events section with a link to your website. If you would like to get involved, please do get in touch and we will be very happy to provide you with marketing material (table cards, social media content, posters for the till and your window etc.) For further details and enquiries feel free to call us on 0207 422 6612 or email us at office@akshayapatra.co.uk. 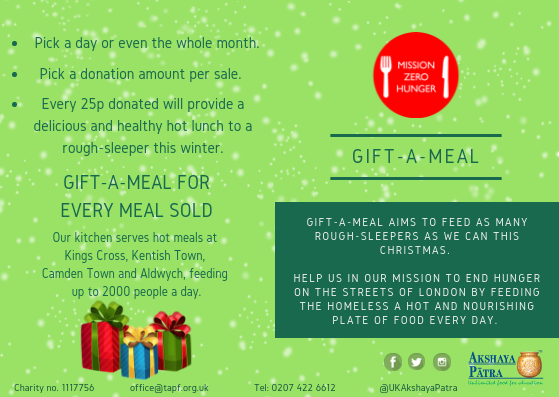 Help us ‘Gift A Meal’ to thousands of hungry homeless this Christmas. If you are an individual who also wants to get involved and Gift-A-Meal Click Here to learn how you can make a difference over the holidays.